When Barack Obama's campaign needed a base for harvesting votes from the southern precincts of Philadelphia, it set up shop in a building owned and managed by controversial real estate baron Kenny Gamble. Also known as Luqman Abdul Haqq, Gamble holds a senior position with the Muslim Alliance in North America (MANA), whose founding is traced to a convicted cop-killer and whose leadership is stacked with radicals. He likewise serves as a community organizer of sorts — one who has been accused of slowly transforming his neighborhood into a "black Muslim enclave." The office opened on August 21 at 1501 Christian Street, with Gamble himself cutting the ceremonial ribbon. 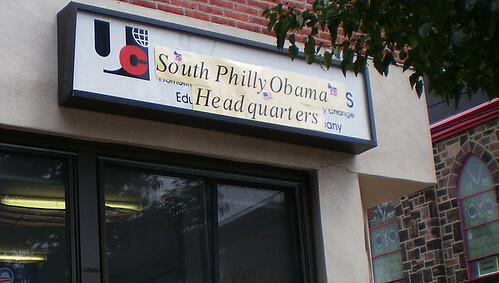 Makeshift banners proclaim it the "South Philly Obama Headquarters," the address of which is listed on the Obama-Biden website as a field office for the Pennsylvania Campaign for Change. Philadelphia tax records identify Gamble as the owner of the property, while signage indicates that the building is home to Universal Educational Management, part of his Universal Companies conglomerate. Gamble's associates and agendas expose him as a dubious figure that politicians seeking to present an image of inclusion would be wise to avoid. This is doubly true for a campaign like Obama's that already has suffered serious missteps in its interaction with the Muslim community. Best known for his work in the music business, Gamble has held high-ranking posts with the Muslim Alliance in North America, which focuses on African-American converts to Islam. That description fits Gamble and most of the group's senior members, some of whom also have roots in the Nation of Islam and Black Panther movement. Indeed, the formation of MANA was inspired by Jamil Al-Amin, the onetime Panther "justice minister" H. Rap Brown. MANA's enthusiasm for Al-Amin remains untainted in the wake of his conviction for the 2000 murder of a sheriff's deputy. He has even addressed, by telephone, MANA meetings at Gamble's United Muslim Masjid. MANA's governing bodies teem with Islamists: Siraj Wahhaj, the organization's amir, was named as a potential unindicted co-conspirator in the 1993 World Trade Center bombing, supports Shari'a-prescribed punishments, and predicts America's demise unless it "accepts the Islamic agenda." Johari Abdul-Malik directs outreach activities for a Virginia mosque repeatedly tied to terrorism cases. Abdul Alim Musa promotes anti-Semitic and anti-American conspiracy theories and has expressed admiration for Hamas, Hezbollah, and Osama bin Laden. Musa's radical As-Sabiqun group advises Muslims to assemble self-contained strongholds, a strategy similar to what Gamble is pursuing in Philadelphia. As he explained in an interview with Saudi TV, "One of the intentions that we had from the beginning was to create a model, so that, in the coming years, Muslims would be able to live close to each other, that they would live closer to the masjid [mosque], that they would eventually be able to open up businesses so that they would be able to employ each other and develop community life." More darkly, Philadelphia magazine has reported that some South Philly denizens "fear that Gamble, a convert to Islam, is inclined toward racial and religious segregation" and aims to carve out a "black Muslim enclave." It is not just the heavily Islamic atmosphere of the surrounding neighborhood — complete with men in traditional dress praying on the sidewalks — that feeds speculation about a veiled agenda. Gamble's bizarre statements to Philadelphia magazine last year added more fuel to the fire: "You don't see the lion with the tiger. You don't see the tiger with the panther," he said. "You don't have people selling goods and services in the Irish community from some other community. In the Russian community, you don't have people from other communities. In the Puerto Rican community, the Puerto Ricans have their own economy, they have their own stores." The article notes that Gamble's musings sound like an endorsement of segregation and a desire to engineer a zone exclusively for black Muslims. The placement of an Obama field office in Philly's Islamist corridor is not the first link between questionable representatives of Muslim America and the senator's presidential campaign. Mazen Asbahi, Obama's initial Muslim-outreach coordinator, stepped down in August for connections to a controversial Islamic investment fund and Illinois imam. His successor, Minha Husaini, then "accidentally" attended a meeting with the Council on American-Islamic Relations and Muslim American Society, two groups tied to the Muslim Brotherhood. In addition, Muslim-Americans for Obama has peddled a policy wish list colored with Islamism and run partisan voter registration drives from swing state mosques, which would appear to violate their tax-exempt status. Obama's staff could be forgiven for accepting contributions from Gamble, but renting office space from him at the heart of his troubling socioreligious enterprise falls well beyond the boundaries of good judgment. Simply put, the campaign is doing business with someone who may embody the type of change that Islamists and racial separatists can believe in.